Experience a ski jump in this awesome 360 video shot with the Panasonic GH5, Entaniya 250, and Samsung Gear 360! 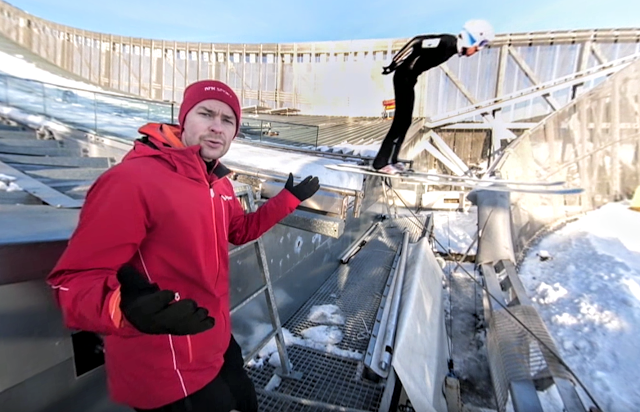 Ever wanted to know what it’s like to ski jump 140 meters into the air? Now you can see with this amazing 360 video! The 360 video is an introduction to ski jumping, featuring world champion Anders Jacobsen and world-class ski jumper Fredrik Bjerkeengen, as Anders explains the skill involved in ski jumping. The video is produced by NRK (Norwegian Public Broadcasting Corporation). The director, cinematographer, and editor is Svend Even Hærra, whose TV studio work I have featured previously. Svend used several interesting techniques, including a innovative combination of slow motion and normal speed video, which is the first time I’ve seen this technique used in a 360 video. 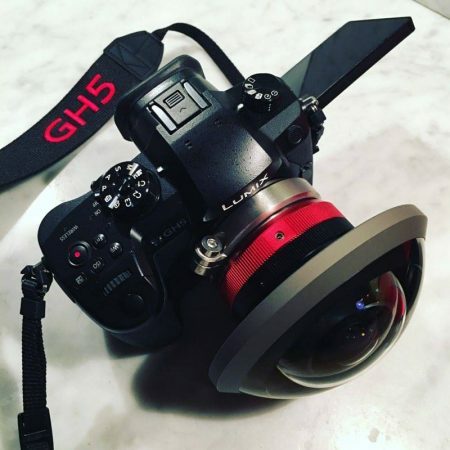 To pull off the slow motion and normal speed effect, Svend used the new Panasonic GH5 and the unique 250-degree Entaniya lens for Micro Four Thirds. To record the front of the scene, he mounted the GH5 to a tripod and made two recordings: one at 30 fps with Anders explaining the ski jump, and the other at 180 fps with Fredrik executing the jump. Svend then turned the tripod head around to take a shot for the back of the scene, taking care not to tilt the camera. He then took a shot straight up, removed the tripod and took a still image straight down. The five videos were then stitched and composited with Autopano. The other technical challenge for the video was capturing the ski jumper’s perspective. They initially tried to create a rig with four GoPro cameras for high resolution but had trouble getting a good stitch. Svend then tried the Samsung Gear 360 (~$250; reviewed here). 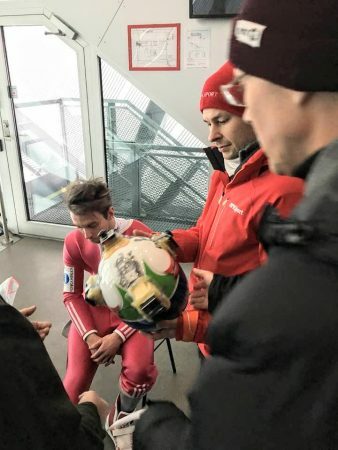 The detail would not be as high, but it would stitch more smoothly as well as make it easier for the ski jumper to jump. One concern was temperature. Svend had experienced the Gear 360 overheating several times. This would be the opposite problem of freezing temperatures. 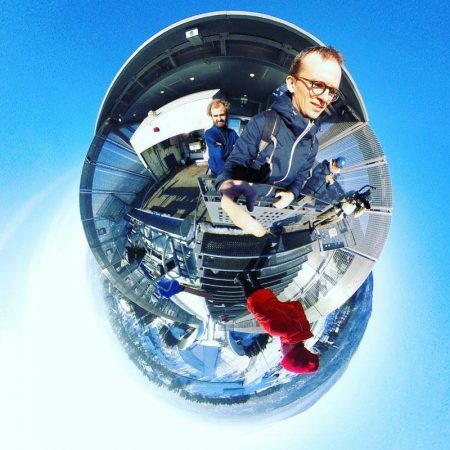 To test the Gear 360’s temperature tolerance, Svend made test recordings in a freezer at -18 degrees Celsius. to be sure about Samsung camera could handle the temperature, and it withstood the freeze test. 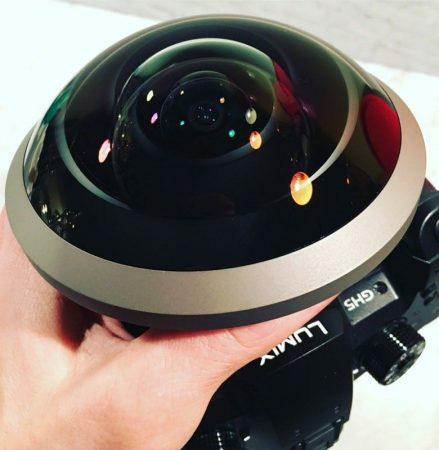 The team decided to use the Gear 360, and ayou can see from the video, the Gear 360 did pretty well. You can follow Svend on YouTube, Instagram and LinkedIn. RUMOR: Is Samsung working on a drone with a built-in 360 camera? Could this 360 video be from the Samsung Gear 360 Pro?